Stables Holiday Cottage is a luxuriously appointed home from home, set in beautiful Dorset countryside in a delightful rural village location close to Somerset & Wiltshire. It is the perfect base for enjoying a family touring holiday visiting the south west & a great base for exploring this excellent walking and cycling area. 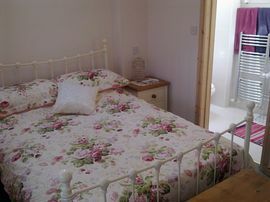 The cottage is attached to the owners farmhouse & historically the building was used as stables and milking parlour. 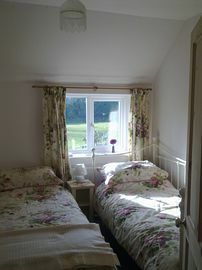 The bedrooms have en-suite shower rooms, TV-DVD & electric blankets for added comfort. Shops and pubs within a mile and many other pubs in the area, serving food and offering outdoor eating and childrens play areas. The farm has a small flock of sheep, ducks & poultry; guests are welcome to walk in the fields to visit them, dogs must be kept on a lead at all times when in any fields containing livestock. Alners Gorse the Butterfly Conservation area is just a short walk away (about quarter of a mile) and there are numerous other way-marked walks to choose from. We also have our own SSSI conservation field which is the habitat of the rare Brown Hairstreak butterfly. The famous Dorset Gap, Gold Hill & Glastonbury Tor with their magnificent views are within easy driving distance, as are many National Trust historic houses & ancient sites for days out, including Stourhead with its famous example of early 18th-century English landscaping & of course, the world famous Stonehenge. The cottage is ideally located to visit the towns of Blandford, Bournemouth, Poole, Dorchester, Shaftesbury, Salisbury and Weymouth. For those interested in history we are just a few miles from our local Rawlesbury Camp (a 5 acre Iron Age hill fort) on Bulbarrow Hill, (with lovely Bluebell Woods nearby) & there are a number of other Hill Forts in the surrounding areas, including Badbury Rings, Hod Hill & Hambledon Hill. With lovely walks on the doorstep, fishing, riding and golf available locally this is the perfect holiday cottage for those who enjoy the outdoor lifestyle. 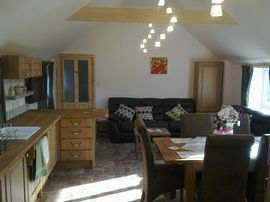 Our luxury �home from home� accommodation consists of: Full radiator central heating, Luxury fully fitted country kitchen with built in appliances including electric hob & oven, fridge, freezer, washer/drier & dishwasher. Microwave, colour TV/DVD. Small library of books, DVD's & games. Electricity allowance, bed linen & towels included in rent. Cot on request. Off road parking for cars. Enclosed garden for relaxation, children/dog play area & patio with furniture. Two well behaved dogs welcome FREE. Sorry no smoking. Shops, pubs & restaurants 1 mile. Two bedrooms: 1 x double, 1 x twin each with en-suite shower rooms. Separate bathroom with Hydrotherapy bath & colour changing lights, vanity unit & WC. Beds have electric blankets for added comfort. Kitchen/family room has dining area with French doors to patio & garden. Sitting area has leather settees, one of which converts very easily to a luxury sofa bed (sleeps two) including double bed size mattress & electric blanket. All beds have luxury duvets. 5th & 6th person discount equivalent to 6th person free. Quality Towels & Hypo-allergenic bedding. 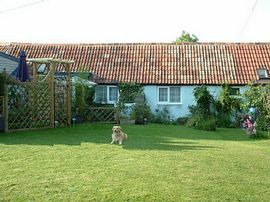 Dogs welcome, fenced garden for exercise & play. Patio with table & 6 chairs, Summerhouse with cane furniture, good garden & small utility area. Use of owners fields for walking. Stabling available for horses by arrangement. Outdoor menage. Grazing. Local Services: Pubs, restaurant, shop about 1 mile. There is an excellent local shop within walking distance for immediate needs & the market town of Sturminster Newton is 5 miles away providing a wide range of supplies. 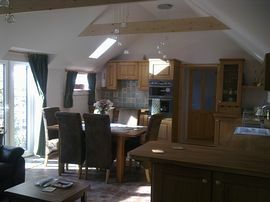 Stables Holiday Cottage is located on the road that links the villages of Hazelbury Bryan with King Stag. Local transport links nearby include train stations at Sherborne, Dorchester and Yeovil. Coach services and buses that run locally and there are also many local taxi firms. Open all year round including Xmas & New Year. Arrival time 4pm & departure time 10am.